Adapted from the phenomenally successful book by Suzanne Collins, The Hunger Games takes place in a future North America which has been ravaged and reshaped by natural disasters and war. In this terrible new world, the continent has been divided up into twelve districts which are ruled over by a decadent and tyrannical Capitol. In order to enforce its dominance, and as punishment for the uprising which occurred 74 years earlier, every year the districts must offer up two "tributes" to take part in the titular games: a fight to the death which is filmed for the entertainment of the Capitol, and as a reminder to the Districts that they live only because the Capitol allows them to do so. After her younger sister's name is drawn during the annual "Reaping" ceremony, Katniss Everdeen (Jennifer Lawrence) volunteers to take her place, and alongside her fellow tribute, Peeta Mellark (Josh Hutcherson) she must find a way to survive the Games, in the process setting in motion events that will drastically alter the world as they know it. As with any first instalment in a series, The Hunger Games has the unenviable task of creating the world and setting the pieces in place that will form part of a larger story whilst also telling its own part of that story. Director Gary Ross achieves this with an efficiency that is at once both admirable - the basic premise is illustrated with three short paragraphs at the start and supplemented by a propaganda film shown prior to the Reaping - and a little wearying. The film seems in such a hurry to establish everything that it needs to that it never stops to let the characters, or the audience, breath and take stock. We're given glimpses of the glossy, superficial world of the Capitol, but not the people who occupy it, so it's hard to get a sense of how distant they are from the reality of life in the Districts, or how they feel about the Games themselves. Even a few scenes here and there could have really fleshed the world of Panem out, but the film is too concerned with realising its buildings than the people who are meant to inhabit them. It's no surprise that the most effective moments in the film are ones which are actually allowed to play out. The scene in which Katniss' sister's name is drawn is played out slowly and silently, with the spell of the awful moment broken only by Katniss' pleas to be submitted in her sister's place. Similarly, the death of a supporting character in the arena at a late point in the film is allowed time to give it the necessary gravitas and to really illustrate the impact it has on Katniss. Both scenes are affecting, but the latter suffers because, in its rush to get through the story as quickly as possible, the relationship between Katniss and that character is only barely sketched out before the character dies. Whilst Lawrence really conveys Katniss' sense of loss in the moment, it seems grossly out of proportion considering the relationship as previously portrayed in the film. Her grief is genuine, but it feels out of place. It's moments like that which highlight the strongest element of The Hunger Games: its cast. The supporting cast of the film is loaded with terrific character actors, each of whom bring exactly the right qualities to their respective characters, no matter how incidental to the main plot they may be. Woody Harrelson is amusingly dishevelled as Haymitch, the mentor to Katniss and Peeta who advises them on how to survive by currying the favour of the audience, essentially manipulating the Gamesmakers by giving them a good story to sell to the crowd. Amidst the drunken bumbling, Harrelson also captures the air of tragedy that hangs over Haymitch as a man who has spent decades mentoring candidates from District 12, only to watch them get slaughtered. Stanley Tucci and Toby Jones, meanwhile, bring a sense of fun - as well as illustrating the unwitting callousness of the citizens of the Capitol - to their roles as commentators who act as Greek chorus by explaining aspects of the games to the audience. Donald Sutherland gets some of the menace of the President of Panem across, but largely seems content to wait for the subsequent films in which he will play a much larger part. Jennifer Lawrence demonstrates the same steely reserve that made her such a compelling presence in Winter's Bone but thankfully without any of the wooden indifference that marred her performance in X-Men: First Class. She gets across both Katniss' grim determination and her basic humanity, showing that she is willing to kill to survive, even though she fundamentally does not want to. More importantly, Lawrence and Ross very pointedly choose not to define Katniss by her relationships with the men in her life, but by her own desire to survive to protect her family. 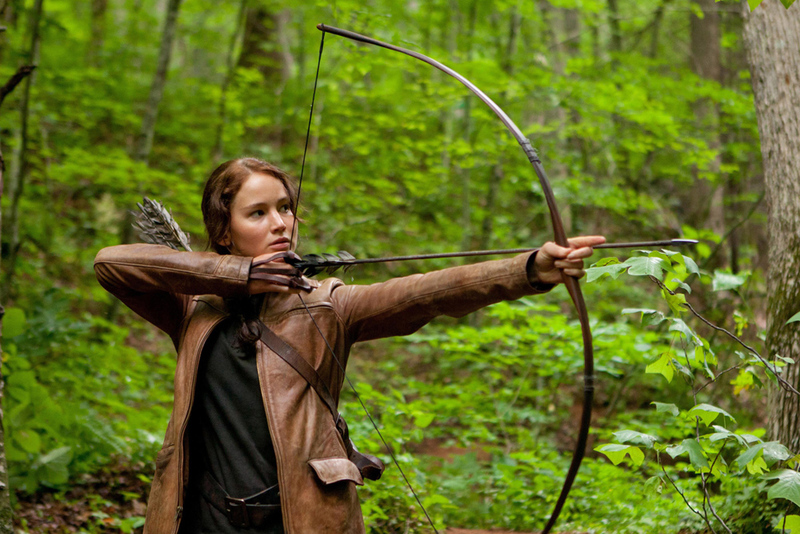 Katniss Everdeen is a strong, resilient female character with her own sense of agency, and whilst the adaptation missteps by removing some of the ambiguity surrounding her feelings towards Peeta, painting them as sincere, rather than a calculated attempt to curry favour in the eyes of the audience, it largely remains true to the character of Collins' books. That faithfulness to the source material benefits the film in some ways, but in others it proves detrimental. The book is narrated in the first person, so Ross and his screenwriters, Billy Ray and Collins herself, take a lot of the information that is conveyed by internal monologue and give it to other characters, and also illustrate events that happen outside of Katniss' comprehension that she may only learn about later. In some cases, as in the moments when Gamesmakers are shown to illustrate just how much they are manipulating what is happening in the arena, this works very well. However, the film still hews fairly close to the blueprint of the book by focusing on Katniss' experiences in the arena, which makes things like the off-screen deaths of the other tributes feel cold and distant, rather than creepy and inhumane as they are in the book. The Games themselves transfer well, and maintain a decent balance of long, unbroken nothingness and sporadic outbursts of violence. The violence itself, though, does not feel violent enough, especially since the Games are meant to be brutal and traumatic for those taking part in them. Obviously, there is only so much actual blood and gore that a film can get away with before it becomes too extreme for its chosen audience, but it does seem to undercut the point of the story, which is to make the Games seem like the sort of horrific spectacle that a corrupt and venal government would use as a means of controlling its people: Making the Games entertaining feels like it is going against the actual message the film is trying to make. The film handles its satire of the tropes of reality television better, ably illustrating the ways in which people on those sort of shows are forced to take on roles in order to be popular, and how the people who make those shows have carte blanche to depict real people as simplistic caricatures. It's not difficult to draw parallels between the way in which Katniss and her fellow tributes are manipulated by the Gamesmakers and, say, the way in which the producers of Jersey Shore force their "cast" to get drunk, then create their own interpretation of those people in the edit suite. Fans of the original book won't be disappointed by The Hunger Games since it manages to stick closely enough to the themes and spirit of the book without sacrificing much in the translation. Still, it feels like a film that could have used a stronger emphasis on its characters and their relationships than its plot and the world. Fortunately the performances and the action are strong enough to make the film compelling, and hopefully now that the grunt work of establishing the setting is out of the way, Catching Fire will be able to build on the character work that the first film has only barely begun.